There is no way this should be judged as a macro lager. It is far too dark and has way to many hops in it. My numbers reflect a review based on it being an AMerican Lager (not Macro) so here goes. This lager pours a copper/orange color and has a lemony spicy hop aroma to it. The head is thin but that is to be expected out of a lager. The flavor is big bitter, one of the bitterest American Lagers Ive ever had. If you like the hop and the bitterness that can go along with them, give this Girl a try. After the upfront bitterness subsides the light pale malt flavor peaks though and a floral hop flavor lingers. Medium gold color, small white foamy head. Aroma is grainy and sweet. 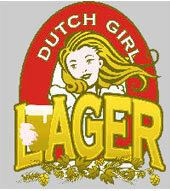 A medium bodied lager. Malts are fruity and sweet. Hops are spicy and mild. Good balance. Nice flavor. Mouthfeel is full. Finish is clean. Aftertaste is slightly bitter. Nice refreshing beer. Pours a light golden with chunks and floaties everywhere wich was unexpected with a creamy like froth on top.A very noticable lemon elemant in the aroma with some grass showing its hop presence with an underlying toasted malt note.Very sturdy lager here definently not watered down nice mouthfeel to it,toasty and quite hoppy for a lager, lemony and refreshing.a damn good beer to have after a day of running around the kitchen,a macro lager hmm to generic a term for this one I think. Pours a nice orange amber color with slight off white head, lacing is average. The smell is slight lemon zest and pine with a sugar malt base, the tate a little to hoppy than I want in a lager, the hops didn't blend right with the sweet toasted grain. Hops almost funky tasting, honey seemed bland. Medium bodied for a lager, good but nowhere near some other lagers. Appearance  This one has a nice, big white head and is a heavy, thick orange in the body. Me thinks this is an Adjunct Lager malt bomb. Smell  Yes, this beer has a big malt nose. Its a bit grainy at times, but for the most part this is thick and malty. Theres an honest effort at balance as well with some light citrus and pine hopping. Taste  Theres a decent hop compliment at the taste as well, but the malts here come on like a freight train. This is one of the biggest Adjunct Lagers that Ive had to date. The malts are thick and taste kind of like barley. Mouthfeel  This is a solid medium-bodied with no hint of sweetness on the tongue. The carbonation is very low for the style. Drinkability  Well, the BJCP guide actually says that strong flavor is a fault for this style. Having said that, this was a big un, thats for sure. I enjoyed drinking it though, so I guess thats all that counts. Hazy, particulate-filled, dusky pumpkin. Who put pureed pumpkin pie into my glass? The orange-tinted, cream colored head is largish after a spirited pour and has quite a bit of stick-to-it-iveness. It's pretty wonderful in the lace department as well. Dutch Girl Lager has a good look, even though it looks more like a pumpkin ale than most pumpkin ales. This just might be the best American macro lager nose I've ever run across. Skagit River is hardly a macrobrewery, so wouldn't All-Malt Lager be more appropriate? It's hard to say what makes it such a good sniffer, so I'll give the credit to hops. Although there's a fresh-milled grain quality that's appealing, the wonderfulness is more in the top notes. The nose is floral, herbal and fruity. Very nice. After drinking, APA is at least as fitting as the stated style. There's a solid, lightly caramel malty backbone with an amount of hoppiness that would make many pale ales proud. The beer is bitter enough and fruity enough to remind me of some type of orange-infused tea. Not as heavy or as biting as black tea, but more substantial than herbal 'tea'. This is definitely an APA, there's no doubt in my mind. All style arguments aside, Skagit River's Dutch Girl Lager is a deliciously hoppy, incredibly drinkable beer that I would love to have access to. I continue to be amazed at the number of excellent, unheralded offerings emanating from the Pacific Northwest. If you run across a beautiful Dutch girl offering you a beer, accept it with a smile. I have an innate distrust of bottles, especially bottles without bottling or freshness dates, and most especially screwtops. Add to that the fact that this is a lager and should have been maintained at refrigerated temperatures without interruption since completing its final fermentation. So when was this out-of-state lager brewed and has it been refrigerated continuously? Where exactly has this Dutch Girl been? Who knows? But I sense so much potential in this beer that Im definitely marking it for further pursuit on draught next time I get north of Seattle. For one thing, the head on this beer is thick as whipped cream and the measure of striated lace it leaves clinging to the glass is remarkable. And these suds have staying power. The head actually begins to push upwards in the center, forming a dome after a few minutes. The distinctive visual presentation is marred only by a storm of flocs that first congregate near the bottom of the glass and later swim about aimlessly in the glass. The mouthfeel is also distinctly full and pouty. I thought at first that the name of this beer might suggest a continental pilsner along the lines of Heineken. The body is actually copper-gold with a taste of golden grains and punctual bittering. The aroma was also grainy and suggested a slight lack of freshness. The lightly toasted flavor and traditional bittering speak of a cogent recipe and quality ingredients. Gotta try a fresh draught to be sure. Served in straight pint glass. Poured a clear, clean, bright yellow with over an inch of sharp white head that dissipated quickly and left a moderate amount of lacing. A typical clean grain aroma, finished with a little hop tang. The flavor was similar, a basic American beer, grainy with a touch of hops. Again, the body and drinkability were typical for this style. Overall, a decent little Lager that us beer geeks won't mind and would make a nice introduction to craft beers for any macro drinkers you know. Your Uncle Glen, who won't drink anything except his macro of choice, would be OK quaffing this beer.